The Missouri Supreme Court has ruled that not only must public bodies like school boards and cities collectively bargain with their employee unions, but that bargaining must be done in good faith. The Court issued two rulings Tuesday - one dealing with unionized teachers at a St. Louis charter school, and the other dealing with police officers in University City and Chesterfield who wanted to unionize. "Essentially, they're complete victories for the labor side," said Bruce Feldacker, a labor attorney who is an adjunct professor at Saint Louis University law school. "There's no question that governmental employers have a much clearer duty to bargain in good faith to teach and agreement now than was the status before these two rulings." 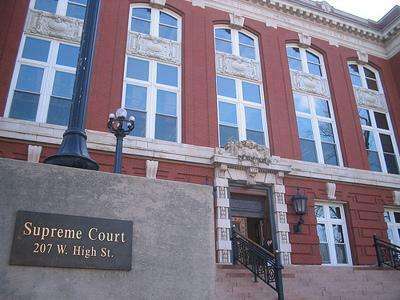 Two rulings from the Missouri Supreme Court have strengthened collective bargaining for public employees in the state. The ruling in the police officer case overturned 55 years of precedent. In a 5-1 decision, the Court ruled that Article I, Section 29 of the state constitution imposes on public bodies the duty to bargain with its employees with the intent of reaching an agreement. An earlier ruling from 1957 said that Article I, Section 29 means that employers cannot block employees from organizing, but do not have to negotiate with the union. But the high court agreed that both circuit court judges had gone too far in ordering Chesterfield and University City to set up a specific framework for bargaining. Gregory Kloeppel, an attorney with the Fraternal Order of Police Lodge 15, said he'd often wondered why that ruling, known as Quinn, had not been reversed earlier. "I believe a lot has to do with respect for the court," he said. "But I think as time went on, they said, hey wait a second, here we have a constitutional provision that says we do have the right [to bargain], and we should assert it." Kloeppel says he looks forward to sitting down with police officers and sergeants in Chesterfield and University City and finding out what they want from a contract. "Sometimes, there is pay issues, involved, obviously, but a lot of times it’s safety issues, just wanting a say in how the department will be run," he said. Officials with Chesterfield and University City did not immediately return calls for comment. In the teachers case, Judge Robert Dierker ruled that the board of Construction Careers Academy had no duty to negotiate with members of American Federation of Teachers Local 420, with the intent of reaching an agreement. The Supreme Court, in another 5-1 opinion, ruled that Article I, Section 29 of the Missouri Constitution, which gives the right of organization and collective bargaining, also means that the bargaining must be in good faith. It sent the case back to Dierker to determine if the board had bargained in good faith with the union. Judge Zel M. Fischer, an appointee of former Republican Gov. Matt Blunt, was the lone dissent on both cases. He wrote that the plain language of the Constitution simply guaranteed the right of employees to organize free from interference, but put no affirmative duty on the city to negotiate. Police officers in U-City and Chesterfield both chose to form a union with authorization cards, rather than a secret election. Feldacker says there could have been an argument made that unionization is only valid after a secret election, but chose not to do so. Smaller companies in Missouri who are regulated under state, not federal, labor law may now also be required to unionize. St. Louis City police officers have entered into a first-ever collective bargaining agreement with the city. Jeff Roorda is a former state representative and current business manager for the police union. He says the agreement removes the main barrier the department had against local control. 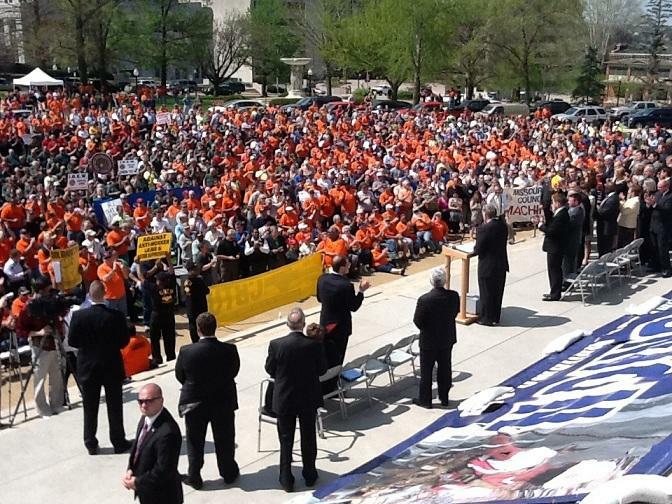 Well over a thousand labor union members rallied outside the State Capitol Tuesday against various bills in the General Assembly they say is anti-worker. In particular, they oppose legislation that would suspend the prevailing wage law in tornado-ravaged Joplin and other parts of Missouri declared to be federal disaster areas. Governor Jay Nixon (D) spoke at the rally, accusing Republican lawmakers and their backers of attacking working people in Missouri.